Choose from a large variety of tree ornaments in various colors and designs. 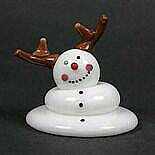 Paperweight snowmen like Frosty, Cat in Hat, Jester, Tin Man, Elf, Reindeer, Santa, Red Hat, Stocking and more. Colorful glass hearts done with a cane application. 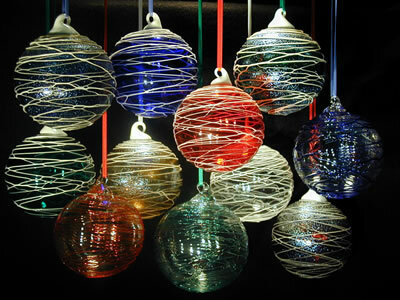 Round Ball Trail Ornaments in exciting colors. Order multiple pieces, mix & match and have fun. Check back often for new additions by other artists. Order early to guarantee delivery. Vitrix art glass snowman. Done in a variety of designs this snowman is the Blue Stocking version. Pictured with a floppy blue stocking hat and matching stocking/scarf around his neck. The rosy pink cheeks, orange carrot like nose and red mouth, add a nice touch. Collect all versions. Approximately 6.75" h x 2.68" w. Signed Vitrix and dated. Vitrix snowman. In a variety of designs, this snowman is the Burl Ives version pictured with his famous mustache, goatee and black derby hat. The song "A Holly Jolly Christmas" was made famous by Burl Ives and has become a favorite Christmas Classic. Collect all versions. Approx. 6.35" h x 2.68" w. Signed and dated. Vitrix art glass snowman. 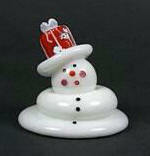 Done in a variety of designs this snowman is the Cat & Hat Paperweight version. Pictured with the traditional hat with alternating bands of red and white, this snowman even has a little facial stubble. A red bow and carrot like nose, add a nice touch. Approx. 6.50" h x 2.65" w. Signed Vitrix and dated. Highly collectable. Vitrix art glass snowman. Done in a variety of designs this is the Charlie Brown version. Pictured with a floppy red stocking hat and big white ears. Approximately 6.00" h x 2.72" w. Signed Vitrix & dated. Vitrix Christmas Tree paperweight. Available in several colors. Pictured below is the Multi-Color. Artist signed and dated. Approximate size: 5"tall x 2.75"w.
Vitrix Christmas Tree paperweight. Available in several colors. Pictured below is the Red Color. Artist signed and dated. Approximate size: 5"tall x 2.75"w.
Vitrix Christmas Tree paperweight. Available in several colors. Pictured below is the Snowy White. Artist signed and dated. 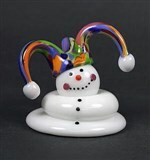 Approximate size: 5.0" tall x 2.75"w.
Vitrix Clown snowman. The Colorful big Bow Tie grabs your attention right away. Black top had and floppy red ears makes this one highly collectible. New for this year and approx. 6.25" x 2.66". Vitrix glass snowman. Done in a variety of designs this snowman is the Dough Boy. His tall traditional white chef's hat adorns the top of his head. Matching white scarf adds a nice touch. Collect all versions, approx. 6.25" x 2.66". Vitrix glass snowman. Done in a variety of designs this snowman is the Dough Girl. Her tall pink chef's hat adorns the top of her head. Matching pink scarf adds a nice touch. Collect all versions, approx. 6.25" x 2.66". Signed Vitrix and dated. Vitrix glass snowman. Done in a variety of designs this snowman is the Elf. Pictured with floppy red and green stocking hat & pointed ears. The rosy pink cheeks and orange carrot like nose, add a nice touch. Collect all versions. 6.75 x 2.68. Signed Vitrix & dated. Vitrix glass snowman. Done in a variety of designs this snowman is the Female Chef. Her tall white chef's hat adorns the top of her rosy red cheeks and black buttons add a nice touch. Collect all versions, approx. 6.25" x 2.66". Signed Vitrix and dated. Vitrix art glass snowman. Done in a variety of designs this is Frosty the Snowman. Pictured with a traditional gray top hat with black band and flower bow. He even has a brown corn cob pipe in his mouth which, adds a nice holiday touch. Approximately 5.75" h x 2.58" w. Signed Vitrix and dated. Vitrix glass snowman. Done in a variety of designs, this snowman is the Gnome version. Pictured with cone style hat in a deep royal blue. Rosy pink cheeks, orange carrot like nose and red mouth, add a nice touch. Approx. 5.75"h x 2.65"w . Signed Vitrix and dated. Vitrix glass snowman. Done in a variety of designs, this snowman is the Hermie version. Pictured with a blue coned hat, red ring & yellow braided wrap. The large white ears, rounded white nose and red mouth, bring him to life. Approximately 5.65"high x 2.95"wide. Signed Vitrix and dated. Vitrix art glass snowman. Done in a variety of designs this snowman is the Jester version. Pictured with a traditional Jester hat, done in a multitude of colors. The rosy pink cheeks, orange carrot like nose and red mouth, add a nice touch. Collect all versions. Approximately 5.25" h x 3.65" w. Signed Vitrix and dated. Vitrix glass snowman. Done in a variety of designs, this snowman is the Lady's Hat version. Pictured with red and green hat & stocking scarf wrapped around the neck. Rosy red cheeks, and red buttons add a nice touch. 6.75"high. Vitrix glass snowman. Done in a variety of designs, this snowman is the Leprechaun version. Pictured with a green Top Hat, adorned with a black band and yellow ribbon. Rosy pink cheeks, orange carrot like nose, red mouth, and large pointed ears add a nice touch. 5.65"h x 2.55"w .
Vitrix glass snowman. Done in a variety of designs this snowman is the Male Chef. His tall white chef's hat adorns the top of his head, and his Mustache and goatee add a nice touch. Collect all versions, approx.. 6.25" x 2.68". Signed Vitrix and dated. Vitrix art glass snowman. Done in a variety of designs, this snowman is the Melting Jester. Pictured with a traditional Jester hat, in a multitude of colors. Collect all versions. Approximately 5.75" h x 3.65" w. Signed Vitrix and dated. Vitrix art glass snowman. Done in a variety of designs, this snowman is the Melting Minnie Mouse. Pictured with the traditional ears and a big red bow. Collect all versions. Approx. 5.70" h x 3.75" w.
Vitrix glass snowman. Done in a variety of designs this snowman is the Melting Mohawk. His tall colorful hair style, and his mustache and goatee and eye glasses add a nice touch. Collect all versions, approx 5.25" x 2.80". Artist signed. 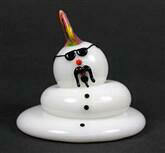 Vitrix art glass Melting snowman. Pictured with a present atop his head in red wrapping and white bow.. Collect all versions. Approx. 5.75" h x 3.65" w. Signed Vitrix and dated. Vitrix art glass snowman. Done in a variety of designs this snowman is the Melting Reindeer version. Pictured with brown colored antlers and a bright red nose. Collect all versions. Approximately 5.25 x 2.58. Signed Vitrix & dated. Vitrix art glass snowman. Done in a variety of designs this is Frosty and Santa Melting snowman, new this year. Choose either or both. Celebrate the holidays with these colorful hand made figures before they melt away. Vitrix art glass snowman. 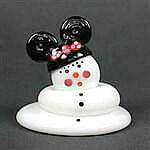 Done in a variety of designs this snowman is the Mickey Mouse Paperweight version. Pictured with the big ears black hat. Approx. 6.50" h x 2.65" w. Signed Vitrix and dated. Highly collectible. Vitrix art glass snowman. Done in a variety of designs, this snowman is the Minnie Mouse. Pictured with the traditional ears and multi-color bow. Collect all versions. Approx. 5.77" h x 3.78" w.
Vitrix glass snowman. Done in a variety of designs this snowman is the Mohawk. His tall colorful hair style , and his mustache and goatee and eye glasses add a nice touch. Collect all versions, approx.. 6.25" x 2.68". Signed Vitrix and dated. Vitrix art glass snowman. Done in a variety of designs this snowman is the Mouse. Pictured with big pink ears, red nose, black whiskers and long pink tail. Collect all versions. Approximately 5.75" h x 2.75" w x 3.18"d. Signed Vitrix and dated. Vitrix Mrs Claus Snowman with colorful red and white hat and arms folded. The rosy pink cheeks and three black buttons add a nice touch. Approximately 6.25" h x 2.68" w. Signed Vitrix & dated. Twenty five different snowman you can choose. Vitrix art glass snowman. Done in a variety of designs, this is Newsie Snowman. Pictured with traditional Cap and Brim. Black dots depict his eyes and three black buttons add a nice touch. Approximately 4.80" h x 2.75" w. Signed Vitrix and dated. Vitrix glass snowman. Done in a variety of designs this snowman is the Pumpkin. Pictured with orange pumpkin on head and curly green vine. The rosy pink cheeks and orange carrot like nose, add a nice touch. Collect all versions. 6.75 x 2.68. Signed Vitrix & dated. Vitrix glass snowman. Done in a variety of designs, this snowman is the Red Hat version. Pictured with flower on red hat & stocking scarf wrapped around the neck. Rosy pink cheeks, orange carrot like nose and red mouth, add a nice touch. Approx. 6.75" x 2.68" . Signed Vitrix and dated.